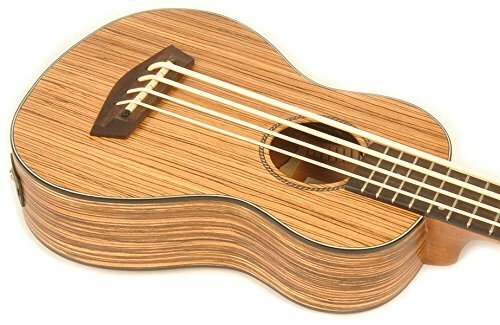 The Hadean UKB-23 Ukulele is a unique instrument with the same notes available to any full size bass guitar (E, A, D, G low to high). It also has the look and ambiance of other ukes. It comes with a preamp and an integrated tuner for amplification and ease of use. This unique combination of a traditional Hawaiian instrument with that of a low-pitched guitar creates a sound that is sure to stand out and add a distinctive quality to your music. All core component of the Hadean UKB-23 Ukulele (neck, back and sides) are made of high quality mahogany wood. The frets are designed to work well with the pre-installed aquila nylgut strings and similar thick uke strings. The bridge and bridge saddle are also designed for use with thick strings like the aquila nylgut. These factors create a design that is both stylish and embodies the uniqueness of the instrument. The instrument’s materials and shape create a warm and soft sound, with a good balance of grind and bite. The pre-installed strings absorb less moisture than similar strings to ensure tuning stability and the gauged strings of varying densities provide increased accuracy of fret-intonation. The integrated tuner allows you to forget carrying around your own tuners and allows for greater accuracy in your tuning as the reading is directly from the preamp. This avoids problems with background noise and interference while making tuning effortless. This instrument sounds more like a low-pitched guitar than a uke. This is definitely an advantage when you are looking for a unique addition to your ensemble or solo play. The UKB-23 (length: 29 3/4″) is rather large compared to a soprano ukulele (length: 21″), the type that you are likely most familiar with. While this seems like a large difference, this is still a very light instrument compared to the weight of most guitars. It is still designed to be a uke, but the larger size helps to lower the pitch to that of a baritone instrument. The thick, solid strings combined with short frets allows your fingers to glide over the frets without catching. All of these features make the UKB-23 is a very comfortable and easy instrument to play and enjoy. The Hadean Ukulele UKB-23 is a unique uke with a distinctive tone that will both entertain and wow your audience. It is professionally designed and expertly manufactured to provide a warm and soft pitch, with a good balance of grind and bite. The materials are high-quality and guaranteed to provide the durability of any well manufactured instrument. The rubberized aquila nylgut strings are high-quality and fit perfectly with this instrument. This uke comes with a built in preamp that is designed to meet all of your amplification needs right on the uke. Tuning this instrument with the integrated tuner is so simple, you barely have to do anything. Along with all of its features, the UKB-23 is almost natural to hold and play. We would rate the Hadean UKB-23 Ukulele as a 9/10 for its design and overall capabilities. If you are interested in owning a ubass or just something unique to add to your repertoire, then consider the UKB-23. Can it replace my 3/4 size EUB on small gigs? Amplified of course. 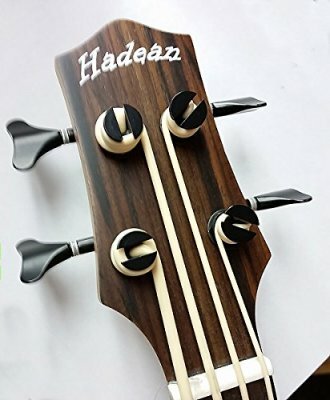 It’s on of the best Bass Ukulele from Headen in this price range, so quality will be there and it should be close to the one you got now. Definitely not a bad ukulele to use, sound is very good compared to those other options in this price range.